We're open late! Sign up to chat with a doctor in 2 minutes or less. Sleep disorder? Skip walk in clinics. See the sleep therapist online. Are you having trouble sleeping? You're not alone. Get a consultation with a registered sleep technologist in 24 hours or less — from your phone, tablet or computer. Available in Ontario. Coming soon to other provinces. 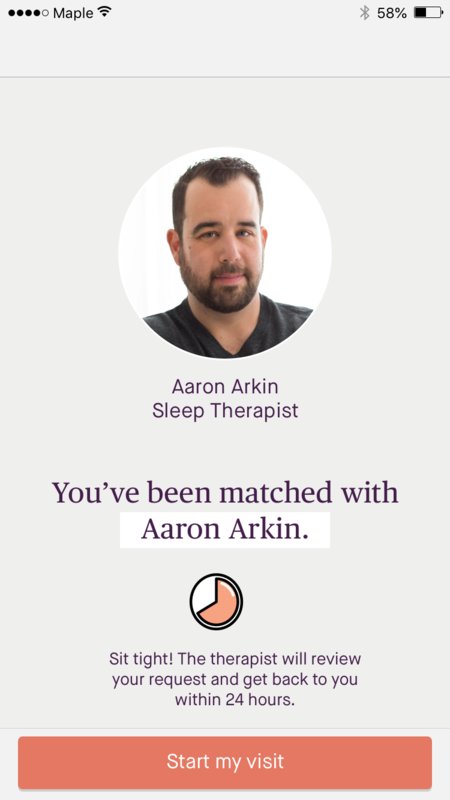 Seeing a registered sleep therapist on Maple is easy. 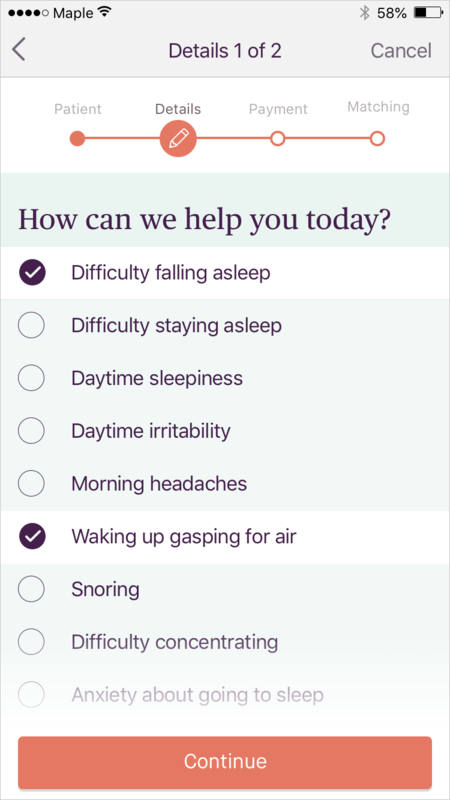 Simply select the topic you'd like to discuss — from difficulty in falling asleep or staying asleep, our therapists can help. Your request will be securely sent to a Canadian registered sleep psychotherapist, and you'll hear back in 24 hours or less. Consultations are $150 — the first visit includes an assessment based on your needs, and suggestions for next steps which may require future visits as part of your customized treatment plan. If you have private insurance, you may be eligible for coverage if your plan includes registered psychotherapists — please check directly with your insurer. The matching process typically takes several hours — a response is guaranteed in 24 hours or less. Once the therapist reviews your request, they will determine whether they can help you on Maple. If they're able to help, the therapist will begin your consultation. If the therapist cannot help, your visit will not start and you will not incur a charge. The therapist will advise if you need to visit a family practice or walk in clinic instead. The therapist will reach out to you and ask to begin an assessment to better understand your sleep and lifestyle habits. From there, they'll recommend a customized treatment plan to address your needs. 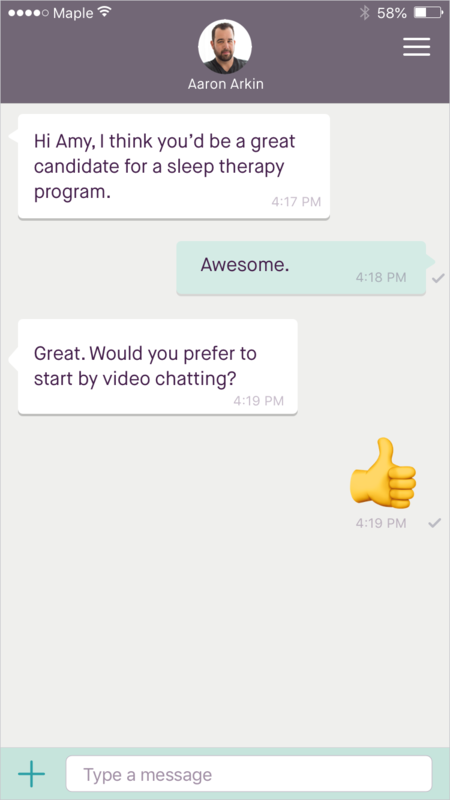 You can choose to speak with the therapist through live chat or video — it's all up to you based on what feels most comfortable. Sleep disorders can take a serious toll on your physical and mental health. Get a consultation with a registered sleep technologist in 24 hours or less — from your phone, tablet or computer.